The “Miracle on the Hudson” flight ranks right up there with historic moments that you will never forget. Who would believe that a damaged plane carrying 150 passengers en route to Charlotte would safely land on the Hudson river and everyone would survive? It seems like it would be a stunt in a Mission Impossible movie, so it’s no wonder the event became a film. Having seen the extensive news coverage of the gripping story and later finding out that my own neighbor was on that flight, I was more than eager to see the movie. To add to the excitement, I love Tom Hanks — I really do. This is a man who can completely disappear into each character he portrays. Once he gets going, you just forget that you are watching an actor at work and you just believe wholeheartedly he is either Captain Sully Sullenberger, he is Captain Phillips, or even Forrest Gump. I really can’t think of another actor who is so adept at his craft. Add to that director Clint Eastwood who blew me away with his directing of American Sniper and it’s a pretty irresistible combination in a film. The question is, how do you turn a six minute flight with an ending everybody already knows into a feature length film? It’s especially hard when the main character is such a beloved hero whose character is beyond reproach and the villain in the story is a flock of geese in the wrong place at the wrong time. 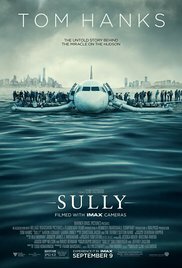 Luckily, the screenwriters worked the NTSB safety hearings into the storyline to create the added tension of questioning Sully’s unprecedented decision. Could the plane have safely made it to another airport instead of the making the more difficult forced water landing? The hearings really highlight how quickly and calmly Sully reacted, using his years of experience to make a brilliant decision. He proves the computer simulations were wrong, showing there really is no match for an experienced and tested pilot. The stress of instant celebrity status is also explored, where the once unknown pilot is launched into a media frenzy with countless interviews and tv appearances. That’s a lot of pressure to put on a man who just lived through a plane crash! These story elements combine to make the film so much more than the crash and water rescue. Aaron Eckhart does a terrific job playing co-pilot Jeff Skiles. While I don’t know what Skiles is like in real life, in the film his quick wit provides much needed humor to the story. Less successful is the part of Sully’s wife Lorraine. While Laura Linney is a great actress, her conversations with Sully are entirely on the phone and the role just doesn’t give her much room to shine. The scenes of the crash are incredibly realistic. While I sometimes lament the overuse of CGI in films, in this case the special effects are incredible and crucial in telling the story. The shots of the plane flying low over Manhattan really take your breath away. After seeing this terrific film, I was very curious to find out what the whole experience was really like for the survivors. Tomorrow you will get to meet my friend Jenny who was one of the passengers of flight 1549 and hear her amazing story in our Smarty Mom interview.